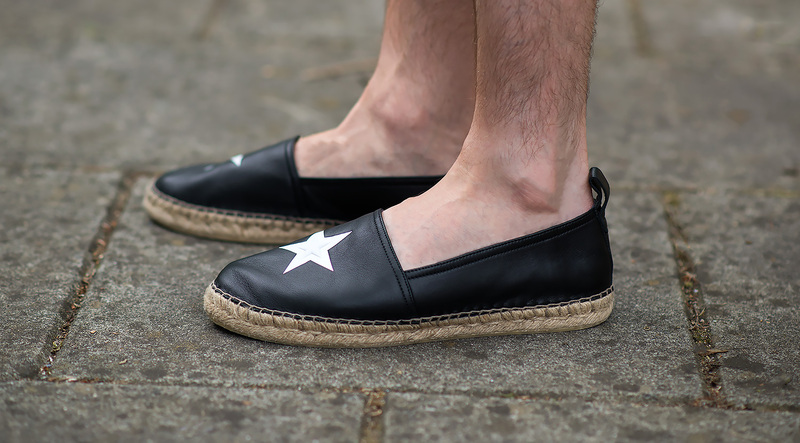 For the past few years I’ve always intended to acquire a pair of designer espadrilles, but usually by the time I’ve made the decision they cannot be found anywhere in my size. This summer I planned on making a purchase before they unexpectedly sell out! 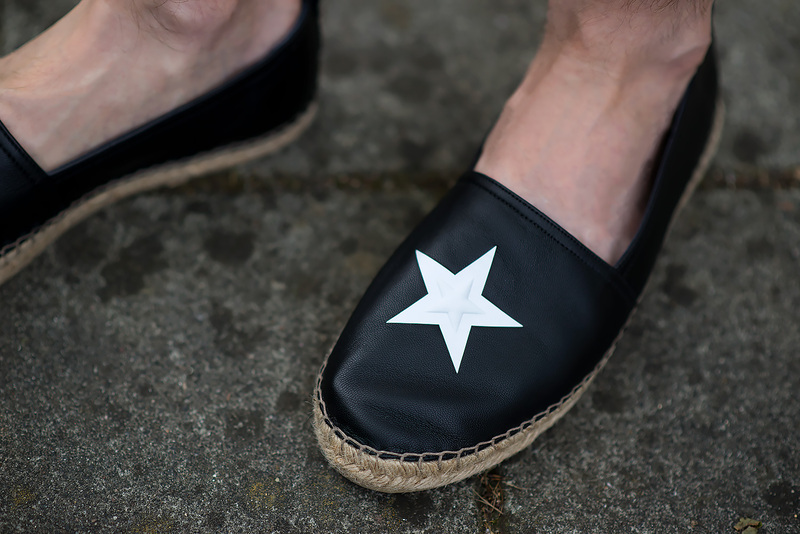 (I’m still grieving for missing out on those amazing palm tree Saint Laurent espadrilles from last year! Still holding out hope that one day they will re-issue them). Previous years I have chosen summer footwear from a wide variety of brands – Bottega Veneta, Tods and their ilk. But more often than not, they end up chewing up my feet with excessive wear and time after time I slink back to my tried and tested Toms. They never hurt my hurt and are a fraction of the price! 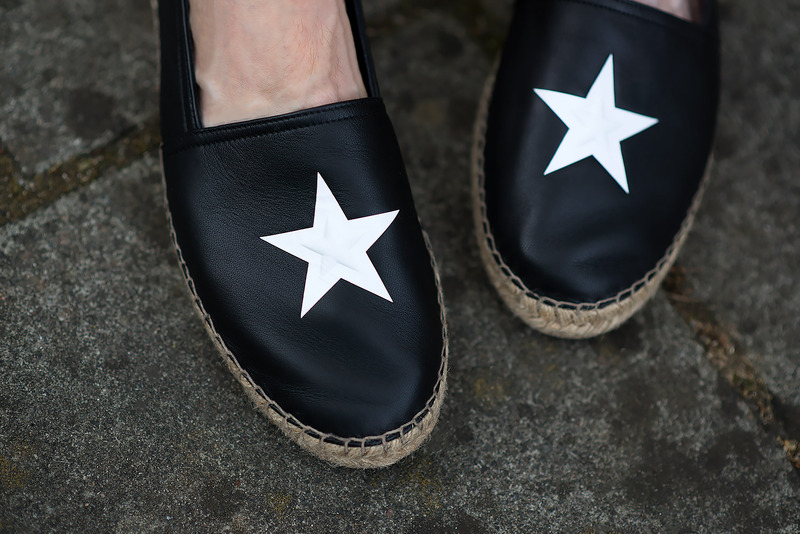 So once again I stepped out into unknown territory and chose a pair of Givenchy Star Embossed Leather Espadrilles from the French fashion label. Naturally I decided to give them a full review on my mens fashion blog. They arrived in a suitably minimalist packaging, sleek white box with just the Givenchy logo emblazoned upon the top in black lettering. Inside the shoes are secured well, each individually wrapped in tissue paper, within each shoe there is yet more paper and a curled roll of foam to ensure it is all held together (making sure the shoes hold their shape during transport and when stored within your collection). The obligatory dust bag is also part of the package. As soon as my hands touched the leather I was amazed at how soft and supple it is! This instantly gave me high hopes that they will be kind to my feet! The iconic Givenchy star logo sits just above the toe area of the shoe, printed in white ink and positioned expertly across the embossing. Inside the shoe itself is particularly minimal, a small amount of leather is stitched where your heel will sit for added traction and comfort. The remaining area is the bare thread (my initial thought was how potentially dangerous this could be to naked feet!). The sole itself is a fairly decent thickness, so very little worry of them wearing out too soon. Additionally they are crafted in Spain, the home of the espadrille. So you are guaranteed a quality product! When slipping the shoes on for the first time, I found that they were the perfect fit. I chose my usually size of a UK 8 / EU 42. However, I did have a worry that my biggest toe was pushing against the tip of the shoe ever so slightly (I hoped this wouldn’t have any adverse effects during regular wear!). The real test of course is a journey outside wearing them, so I planned on wearing them on a typical shopping trip (this would surely test comfortability). Over the course of the few hours that followed, I’m happy to report that I felt no adverse affects! No rubbing, pain or discomfort! (I actually took a pair of low profile socks just in case, which is my usual protective measure when wearing new shoes these days). When I finally returned home, there wasn’t even a hint of a red mark anywhere on my foot! 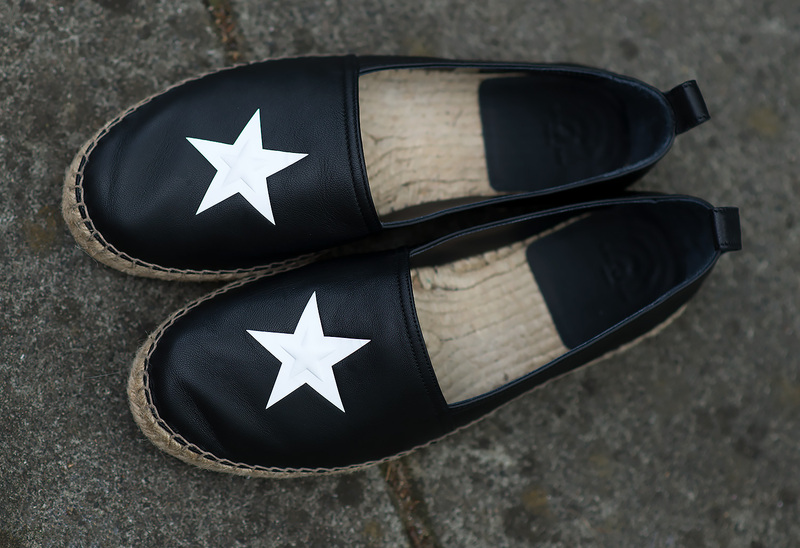 In summary, these Givenchy Star Embossed Leather Espadrilles have passed all the tests! Look great with the star logo adding a special touch, they feel sublime on your feet and most importantly are super comfortable! Finally a win for a designer brand for summer footwear! 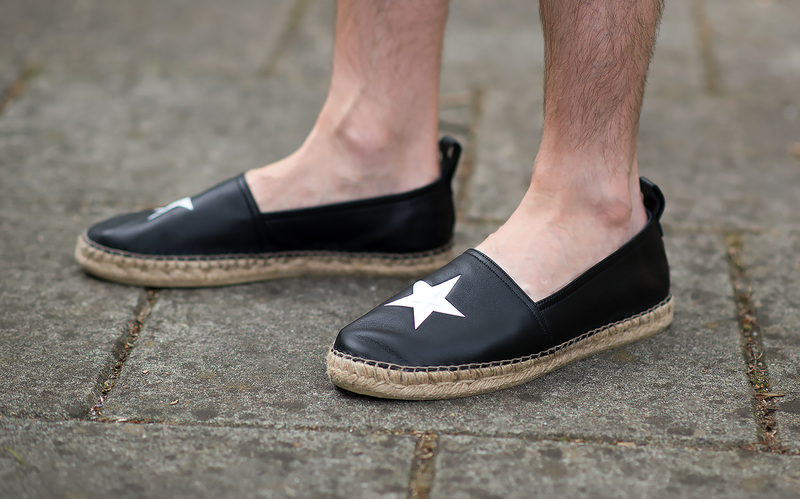 Please let me know what you think of these men’s espadrilles in the comments below. Hi Maxwell, I’m glad you liked my review! Yes, after these I’m now a big fan of Givenchy! These are the only Givenchy shoes I have tried on, sorry about that. I normally wear a 42 in most of my premium footwear. I also have a 42 in Tods and a 42 and 41.5 in Bottega Veneta driving shoes, if that will help any!